Mukundbhai’s initial interest for Dharmaj developed in Kenya, when he was encouraged by his parents to accompany them when attending annual Dharmaj Samaj gatherings organised for families of Dharmaj origin residing in and around Nairobi. He remembers these events as very well organised and coordinated to achieve a lively family atmosphere, where the food and facilities provided were of the highest standards and all those who attended were full of praise for the organisers and always looking forward to next annual event. The youngsters would mainly be attracted by sumptuous food whereas the adults mainly attended to maintain and develop social touch with Dharmaj and to catch up with developments with friends and families as they grew up in foreign environment. Mukundbhai’s attendance at these functions seems to have seeded his initial attachment to the village of Dharmaj and made him proud for being connected and having ancestral connections with Dharmaj. He had thus developed a deep sense of pride of being of Dharmaj origin, despite having been born in Kenya and never having lived in India. His first visit to Dharmaj as a seven year old in 1956 was when he accompanied his parents on their extended home leave. He spent around four to six weeks in Dharmaj around March / April in 1956 and recalls being temporarily admitted to local primary school for a few weeks and having coming from abroad he remembers how lucky they were that they could afford better equipment (i.e. pencils). The local children were keen to swap their writing slate pens etc with his pencils. The school that he then attended lacked basic facilities that were taken for granted back in Kenya. Mukundbhai feels that this is sadly the case even today, although comparable standards have much improved, the gap in relatives standards is still very evident. His next visit to Dharmaj was in June 1970 when he had travelled from London as a young tourist. He had first come to London in July 1965 at the age of fifteen directly from Kenya following his father’s retirement who had decided to move back to India. Mukundbhai was allowed to accompany his elder brother Bharkarbhai to London for the betterment of his education and future settlement prospects. Once his parents had moved back to India they eventually settled in Vadodra following initial few years in Dharmaj. On that occasion his visit to Dharmaj was limited to just a day trip to meet his relatives. But it did not in any way dispel his original memories of 1956, when he had actually stayed at his original family home for several weeks, and those memories still remain very well impregnated in his mind. Since then Mukundbhai have visited Dharmaj several times but has not had any opportunity to stay in the village for any lengthy periods. However, in contrast, his association and involvement with Dharmaj Society of London has been extensive and holds deeper roots. 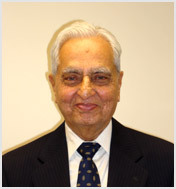 His interest developed at the very beginning around 1967-68 when as a teenager he witnessed founder members meeting up at the residence of his late brother Shree Bhaskarbhai to initiate the formation of Dharmaj Society of London. These initial meetings were organised by enthusiastic and keen patriots of Dharmaj origins residing mainly in South London. The Dharmaj Society of London was thus formed in 1968 by these few enthusiasts, mainly to allow social integration for individuals and families who had recently arrived in London. Some of our current senior members will indeed recall regular initial gatherings that were held at Church Hall on Beechcroft Road, London SW17. These gatherings generated tremendous feeling of brotherhood and most members attending looked forward passionately to next functions. In those days most members were new immigrants and fresh to the UK, often taking up unfamiliar employments, living in rented accommodation and dependant on public transport to move around etc. Lifestyle for them was much unfamiliar with entertainment at home being restricted to black & white televisions, offering just two or three channels at the most. The only contact with culture was to listen to recorded Hindi music and songs or watch occasional Hindi movies at weekends at selected cinemas. In such surroundings the society’s gatherings were the only source of social and cultural get-togethers for members and thus all events were well attended, enjoyed and appreciated. Mukundbhai’s initial participation was just to help at these events, in what ever way possible. This would encompass a multitude of activities ranging from peeling potatoes, the odd cleaning and selling raffle tickets etc. Mukundbhai qualified as Chartered Accountant in 1974 and very soon thereafter he was made part of the main committee and handed over the responsibility to look after Dharmaj Society’s finances and prepare annual accounts etc. Since then he has played a senior role in the committee undertaking additional responsibilities and roles required of him. In being a member of the committee, his desire has always been to see DHASOL progress for the benefit of the current, as well as the future, generations in the United Kingdom and back home in Dharmaj. His first key challenge was to draw up a suitable constitution and to register DHASOL as a charitable organisation with the Charity Commission and thus provided the society with a vision and purpose for changing requirements. As a result, DHASOL has been a registered charity since 6th July 1998. Mukundbhai feels that perhaps the best contribution that he has made so far to DHASOL and for the people of Dharmaj, has been through his involvement in the Sharda Maternity Hospital complex project. He is proud to be the initial chairman of the special Maternity Hospital committee through which the society planned and raised finance for the whole project. The society had an excellent commitment from the whole committee that allowed them to achieve realisation for this dream project within in a short period of time. This is a perfect example of a well achieved charitable objective that he feels ought to be replicated elsewhere. 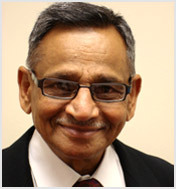 Mukundbhai was honoured to be the president of DHASOL having served a number of years as vice president. He hopes to see DHASOL make further progress in meeting the requirements of our changing needs and in time to hand over a worthy organisation to a newer generation who would wish to continue to maintain a link to their roots. In doing so, he looks forward to your views and suggestions for directions that may keep new generation in focus. The society has moved on over a long distance since our pioneers laid the foundations forty years ago and times and circumstances are significantly different now compared to those early times. The society is well settled, with greater disposal incomes and enjoys significantly higher comparable standards of living that ought to make us better placed to be charitable and help in improving conditions at our roots. The task facing the society now must be to show the new generation what Dharmaj is, what connection they have with the village and more particularly why they should be proud to have a Dharmaj connection and how they can keep an attachment with our roots. Mukundhbhai looks upon the younger generation to join us and play an active participation in organising events that help us in keeping our Dharmaj connection going. Bhupendrabhai is the youngest of three brothers who spent much of his youth in Dharmaj and came to Uganda for settlement in 1955/6 where he was to join family hardware business. He stayed in Uganda until Dada Amin decided to give quit order to all Asians where upon he together with his family elected to settle in UK. He quickly settled down and took over news agency business in London which he operated in partnership with his elder brother for many years until his retirement a few years ago. He was keen social worker and enjoyed helping in organising social events. He joined DHASOL and quickly began to play active role in Society’s affairs and was soon elected as secretary of the Society which he honoured with full commitment and dedication and brought further discipline in effective running of the Society. He further contributed to the development of the Society by holding the positions of Vice President and then President for a number of years. He also represented DHASOL at six gham and other affiliated organisations. He is still remains a very much active member of executive committee of the Society and always shows willingness to volunteer at all events organised by the Society. He has been keen supporter of all projects for betterment of lives of local residents in Dharmaj and has supported us well both practically and financially in Sharda Maternity Hospital Complex and has been the leading donor and sponsor for the construction of Mineral Water plant in Dharmaj. We very much value his continued presence on the committee. Born on 17TH August 1939 in Kampala, Uganda, Manharbhai was only a year old when he and his eldest sister were taken to India to be brought up and educated by his paternal uncle and grandmother. He attended the local village school in Sojitra for most of his primary education and reached matriculation level in Vadodra in 1955. Under the care and influence of the family elders, he developed his basic social skills and caring nature during his formative years. He has, in particular, a clear memory of his childhood experiences of living with grandmother and uncle. He also relates to the positive and constructive influences of association with his blind maternal great grandfather whom he took charge of caring. These have helped him in shaping his character and attitude to life. When he was 15, he returned to Kampala and for the first time met his father, mother and rest of the family that had now increased by two brothers and three sisters. His father was a senior audit clerk in a reputable firm of Chartered Accountants in Kampala. It was his wish that his son would continue with education and gain a qualification. However, Manharbhai was troubled by his father’s poor health and the prospect of supporting a family of nine on a limited income, so he decided take up employment to support his father rather than complete his education. Thus Manharbhai commenced his first occupation as a motor parts sales assistant with a starting monthly salary of 350 shillings. In 1956 his father was promoted and posted to Mbale, a town some 150 miles from Kampala, and this meant that whole family had to move. Manharbhai was forced to change employment and took up a position as a shop assistant in a wholesale business operated by Dahyakaka of Ranoli. Later that year his elder sister Jyotiben was sadly killed in an accident. Further tragedy hit the family in December 1957 when his father passed away and complete responsibility for the family now rested on Manharbhai’s shoulders. His mother Shardaben supported him and encouraged him in his efforts, whilst she stayed at home to raise the younger siblings on very little money. He proudly recalls how at the time of his greatest need, Dahyakaka understood his predicament and also supported him. To this day Manharbhai is profoundly indebted to Dahyakaka for such generosity. He further supplemented his income in other ways, like being a part time insurance agent. Under Dahyakaka’s coaching he developed other skills like practical book-keeping. This took him to another employment in 1959 at the age of 20 as a branch assistant-accountant for an auto dealer for General Motors, providing for the entire welfare of the family, and in particular the education of his younger brothers and sisters. During the period 1965 -1969 he was deeply involved in the local cricket club where he supported young aspiring cricketers to raise funds for the club by organising events such as fetes. In 1966 he also played a role with the members of the cricket club in successfully rescuing and restoring the town’s Hindu temple from a financial disaster and poor management. However, his sole purpose in life was the responsibility of his family. After independence, the political climate in Uganda was becoming more nationalistic. He was courageous enough to take a decision to migrate to England as it was becoming more and more difficult for non citizens to continue to hold employment. During 1970 his entire family had migrated to England. This was a masterly piece of insightfulness on his part as within one year Idi Amin gave marching orders to all the Ugandan Asians. Soon after arrival in the UK he took up the post of junior accounts clerk with a car dealership group at the initial weekly salary of £7.30. With his zeal and resourcefulness he impressed his employer and within six months his salary was increased to £20 per week. He brought the company books up to date and was commended by the company’s auditors. He soon enjoyed the perk of a company car and freedom to recruit any employee of his choice, which meant he was able to help some of his ex-Ugandan friends with employment. He was later appointed the position of Assistant Group Account, which he remained in until 1976. He then left the job, preferring to go into his own business. He delayed his decision to marry until the rest of his family were secure in their positions, and then he married to Pushpaben in 1974, and is now a proud father to Heena (1975), Ushma (1978) and Anushka (1984). With his support and encouragement for both of his younger brothers, Anilbhai and Bhupendrabhai respectively achieved professional qualification as Chartered Accountant and Certified Accountant, much as would have been dreamt of by their father. Both of his brothers are closely attached to him and have seen him as a fatherly figure from their very young ages. Manharbhai was also happy to see that all of his sisters were happily married and well set. He operated several successful retail businesses between 1976 and 1982 and then launched his shop-fitting and design business, Equip Display Systems Ltd in 1984. This occupation made him highly knowledgeable in high street retail businesses, merchandising techniques and customer psychology which has all been of great value to him in advising his clients with whom he became personally involved in offering solutions. He is no mean draftsman either, as he can measure a shop and produce drawings when it becomes necessary – another self-taught skill added to book-keeping and accountancy. It was also not until 1984 that he joined The Dharmaj Society of London where he has developed his affinity for Dharmaj and passion to help the Dharmaj Society develop. Having been raised in Sojitra, he admits to being initially a reluctant lieutenant, but was quickly persuaded by the Late Shree Hariprasad Chunibhai Patel to join DHASOL and allow the society to progress to its current state. His dedicated commitment to DHASOL’S causes was apparent from the very beginning and he wished all members knew each other well and worked as one family. He displayed an excellent ability of creating team spirit and enthusiasm for organising functions and events. His qualities of boldness and leadership developed during his teenage years have brought him immense respect from all those who know him and have taken him to the position of the Chief Executive of DHASOL. Since joining DHASOL, he has widened the scope of charitable activities and the standing of DHASOL amongst Asians in England and Dharmaj. He has led from the front in organising all events, and where possible he has encouraged members to work together to make events successful and enjoyable. He has promoted self-help during major events to save on costs. Typically he has advocated for financial prudence on catering for events like the annual gathering and the barbeques through in-house cooking by members and their families. His affinity for Dharmaj intensified with his involvement with DHASOL’s project, Sharda Maternity Hospital, for which he gave his whole-hearted commitment to achieve a most modern facility for people of Dharmaj and the surrounding areas. He was instrumental in the planning of the hospital, raising finance, supervising construction, equipping it, and ensuring that it opened on schedule. In achieving his objective he spent countless hours of his precious time in travelling to and from India and made numerous phone calls lasting for hours and all this at his own cost without claiming back a single penny for his personal expenses. His satisfaction was in achieving this objective for Dharmaj and DHASOL without expectation of any personal reward or recognition. His dedication and commitment saw further addition of doctors and nurses accommodation to the hospital complex. Now Dharmaj has a well equipped hospital that has been complimented all over the world. He played an equally committed role jointly with Bhupendrabhai Ambalal Patel & Dinubhai Raojibhai Patel (Dinukaka) in the development of a mineral water plant for which he worked effortlessly using their own resources to provide Dharmaj pure drinking water. Whenever there has been a worthy cause identified, he has been DHASOL’s backbone in supporting the fund-raising for provision of relief such as Gujarat earthquake. At home he is very much a family man and has instilled qualities of wonderful personalities into his three daughters and wife, all of whom joyfully engage in all social and cultural activities to support him. He is also passionately committed to the development of the Chha Gam organisation and in particular he has played a leading role in events such as matrimonial introductions. He remains committed to the preservation of our culture and his ambition is to build a strong foundation for our culture that can be passed on to our future generation as our true heritage. To fulfil the wishes of all the present and past committee members and trustees he identified and negotiated the purchase of the property called Liberty centre in Wembley. With the support of Gauresh V Patel he managed to secure a Bank loan to finance the purchase. Dinukaka and Mukeshbhai Patel of Chetna Caterers provided the support to complete the refurbishments and now the site is ready to use as DHASOL’s main office and a meeting place. Manharbhai supervised the entire undertaking to its completion. This achievement is a major landmark in the history of DHASOL, and is only viewed by many as just the beginning of greater things to come. 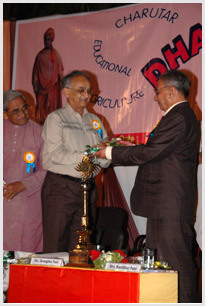 Manharbhai’s achievements in the work he has done for the society were rewarded to him in January 2008 when he was honoured with the ‘Dharmaj Gaurav’ Award. This award was in recognition of his continuous efforts and outstanding contribution to Dharmaj. This is a truly remarkable account of a man of humble beginnings who has risen to become a much loved and respected son of Dharmaj who grew up in Sojitra and had no idea that he would achieve so much in life for others by giving himself to their wellbeing. We are all very proud to have him amongst us. 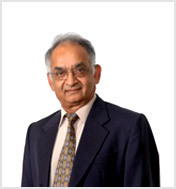 Dinubhai Raojibhai Patel, a retired bank clerk has been a long standing senior member of DHASOL. In addition to him being an elected Trustee he is very active in the management committee and works passionately in furtherance of our objectives. He remains committed to what ever responsibilities have been assigned to him and proudly carries out his duties without having to be reminded. He has on many occasions allowed us to use his residence at short notice to hold committee meetings and to undertake preparatory cooking for forthcoming events. He is popular amongst the local community and that enables him to network and promote DHASOL’s activities and frequently be our leading revenue generator. He is an appointed DHASOL trustee to represent us at Chha Gam Nagrik Madal, a nominated representative with NCGO and is a member of our property acquisition and maintenance committee. He holds the keys to the Liberty Centre property and actively manages the hiring out of the property and ensures that the property and its contents remain secure and in a clean and presentable state at all times. 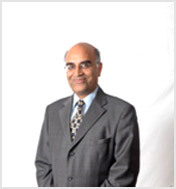 He rigidly maintains the inventory of DHASOL’s furniture, equipment and stock. He regularly travels to Dharmaj and ensures to keep our committee here updated with progress at home. Pravinaben has been prominent member of Dhasol for a number of years. She has continuously offered her social skills and eagerness towards organising events such as Navratri and religious and cultural events that Dhasol have promoted. In addition to her duties with Dhasol Pravinaben is also an active social worker in her local community of Harrow. 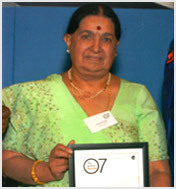 Although she had officially “retired” from Victim Support Harrow in 2005, Pravinaben has still managed to be a valued volunteer for them. Her commitment to the support group was rewarded by her winning the “Outstanding Achievement in Caring for Victims” title and this is something that has brought pride to our whole community. She joined Victim Support in 1992 focusing primarily on supporting victims of serious crime and she also played a key role in ensuring that the support they offered reached remote communities that are particularly difficult to contact. Pravinaben had helped to set up two drop-in centres in the local community centre and a hospital. These skills of compassion and care acquired through her work with Victim Support locally, is something that reflects in Pravinaben’s loyalty to Dhasol as well. She has been able to give her enthusiasm to help build on Dhasol’s charitable work and offer fundraising ideas; because Dhasol is also a community that Pravinaben passionately cares for and has made herself an asset for. Pravinaben is some what of an inspiration to the Dhasol committee, as well as her local community. She has shown that whilst offering charitable support to Dhasol she has also been able to play an active role in the Victim Support group, which deals with issues that are much closer to home. Her time and voluntary commitment has been much appreciated by Dhasol and we hope that Pravinaben continues to excel in her charity work. These short profiles of some of our longstanding current committee members has been put together by some Trustees and other members of DHASOL. Any mis-statements or omissions are not deliberate.